Retired Pasadena firefighter Walter Patrick Ireland, aged 94, died earlier this week after a short illness. In 1949, Ireland was involved in the two-day effort to rescue 3-year-old Kathy Fiscus from an abandoned well in San Marino, California. Kathy had been playing in an open field with friends when she disappeared underground after falling into the 14" opening of the uncapped well. Kathy was already dead by the time she was pulled up from a depth of nearly 100-feet. Accounts differ as to who pulled her up. The Pasadena Star-News article linked above credits Ireland, while the TIME magazine article (also linked above) indicates that it was firefighter Bill Yancey. In any case, Ireland joined the Pasadena Fire Department in 1940 and retired as a captain after 34 years of service. For 27 hours, Los Angeles TV station KTLA pre-empted its regularly-scheduled programming to broadcast live news coverage of the event to its viewers, instantaneously bringing them each new wrinkle in the horrifying story. Media historians generally agree that KTLA's coverage of the event set the standard for the kind of live on-the-scene reporting that we still see today. Within weeks, Kentucky singer Jimmie Osborne had recorded The Death Of Little Kathy Fiscus for the King label, which became a top ten hit. In 1964, Starday released the Howard Vokes version of the song, which can be heard below. That really was a watershed moment in television history and one of the intrepid KTLA reporters who stayed there for those 27 hours - Stan Chambers - is still on the air with the station. He's been there since KTLA first went on the air 61 years ago and has been on the scene for just about every major news story that's happened in Southern California, from little Kathy to the Manson family to Rodney King. He's also a really dear, sweet man in person. 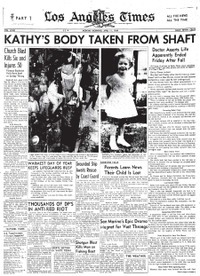 The Kathy Fiscus story is one that has been repeated to me by my parents all my life. It seems to have been etched into the heart and soul of every viewer in LA at that time. Yes, Stan Chambers made a name for himself covering the event...he's the greatest! Funny, every year there's usually a story concerning a child who's fallen down a well...archetypes! Not one mention of darling Baby Jessica? I wonder if there are any songpoems for her out there...where's Irwin when you need him? So do we inadvertantly have KTLA to thank for the coverage of car chases and armed standoffs? Dale Hazelton - "So do we inadvertantly have KTLA to thank for the coverage of car chases and armed standoffs?" I would have to say "YES" - KTLA has always been a little more independent and renegade than LA's other news stations. I remember seeing my first televised police pursuit in the early 1990s (pre-OJ Bronco chase) - a little Vietnamese guy in a Toyota was shot and killed by the cops on an off-ramp near a mall. KTLA covered the whole thing, including the fatal shots through the guy's window. KTLA (the renegade) has really gone downhill since lead anchor Hal Fishman died last year...now it's all just happy news. Shaft called, he wants Kathy's body back. And we're sending our love down the well! We're sending our love down the well! I remember a song about little Cathy Fiscus many years ago...Does anyone have the words to this song? I remember when Cathy fell in the well...think I was around ten years old. Everyone in our community stayed up around the clock waiting. The news broke all our hearts! I was 10 years old aat the time of this tragedy. At the news of the confirmed death I was struck with the thought that there could not be a God if he would let someone so young die like this. The idea still exists with me today. I am now 58 years old and just found out last night that I was named after this little girl. I have never heard the story and started to search for it today. I was named after this girl. I have known that all my life. I was born on May 26, 1949, and my mother, apparently moved by the story named me after the little girl. I was born in Grand Rapids, Michigan, by the way, which shows how far the story traveled. It is a little creepy to be named after a dead child, but until the internet, I never really knew whether this was some figment of my mother's imagination. These stories are interesting to me. This Message is for Peter Daly and others who question the existance of a kind and loving God. Yes, Peter, there is a God and he loved Kathy so much that she did not have to prove her worth here on earth as do the rest of us. She was so perfect that God called her home at the tender age of 3-years. I remember laying in our swing with my head in Mommys lap & I would ask her to sing me the song of Kathy Fiskus. She would & I would cry. I was 4 or 5 ar the time. On April 8, 1949 I was 4 1/2 years old. I was playing outside my house when suddenly the ground gave way beneath me. I have no memory of what happened in the next seconds; my next memory was of standing on the porch steps screaming for my mom. She came at once, noting that I was covered in mud from my toes to my groin. Beside the steps was a circular area, about 20 inches in diameter, muddy, with two imprints where my legs and feet had been. When my mom touched the area with a stick, the mud gave way, showing a hole which we later learned was 12 feet deep. The fire dept. was summoned and they asked me how I managed to get from the hole to the steps. I said I "hopped like a bunny". My mom was told that it was a miracle that I had not gone into what was an old, disused, hand-dug well that had never been properly sealed once it was no longer used. Some hours later, we heard the news about Kathy Fiscus. Needless to say, my family was very thankful that my fate was different from hers. I have always felt a strange sort of kinship with this little girl I never knew and I have often wished that I could remember how I got out of the hole...From the shape of the prints, it looked as though I must have been lifted straight up. A mystery. The fire dept. filled in the well, but forever after, I avoided stepping on it, and in later years when I brought my own children there, I watched them constantly. I was 6 years old when Kathy Fiscus fell down the well. I watched the live coverage with my parents and was very much aware of the connection -- as children -- between myself and Kathy. Stangely, for years I remembered the event as having ended in the successful rescue of the little girl...I guess I wanted to remember it that way. I'm now 69 years old and still recall her day...even the correct spelling of it because of the impact I felt at the time. My name is Kathie and I was born in June of 1949. My Mom named me after Kathy. We lived in Southwest Michigan, showing how far the story of Kathy had traveled. I don't find it creepy to be named after "Kathy" at all. She couldn't help what happened to her and I consider it an honor to have the same name. God Bless You Kathy! I remember this story and song. I could not wait to get the newspaper to read it.I was 9 years old with a birthday coming in 19 days.So sad. Did Kathy Fiscus have siblings? The director of the rescue, Raymond Hill, was my grandfather. We heard about the rescue from my father. I never heard my grandfather talk about it.